Burton's Friendship Garden by V. A. Boeholt and Nathaniel Jensen. A Burton the Scarecrow - Friendship Tales from the Farm Book. Review: Have you ever needed a little help from a friend? If you have, you will be able to relate to Farmer Green in Burton's Friendship Garden, a remarkable book written by V.A. Boeholt and illustrated by Nathaniel P. Jensen. 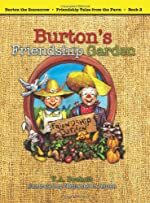 Two scarecrows, a farmer and some animals are the main characters in Burton's Friendship Garden, the second book in the Friendship Tales from the Farm series. One day Famer Green is getting prepared to plant his crops, but he decides to plant the seeds the following day and tells Burton the scarecrow as they say goodbye to each other .The next day Burton waits all day for Farmer Green, but he never come. The following day Burton sees a crow who says that he saw Farmer Green in bed with both of his legs wrapped in white stuff. Burton knows he must have gotten hurt. The scarecrows and the animals talk together to come up with a plan for helping Farmer Green. Will he ever be able to plant his seeds and be ready for the harvest? Someone should read Burton's Friendship Garden to young children because it will help them learn to work together. Burton's Friendship Garden is appropriate for both boys and girls who are ready for slightly more advanced reading. The book is a bit long which might allow children to lose focus. It is nice that there is a glossary in the back of the book so younger readers can learn about the more difficult words. The talking animals are adorable, and the valuable lessons about teamwork, keeping your word, and friendship make this a perfect book for younger children. We would like to thank Five Star Publishing for providing a copy of Burton's Friendship Garden for this review. Have you read Burton's Friendship Garden? How would you rate it?